The guest speaker for the April GASIG meeting at Mac Business Solutions was Harry St. Ours, Professor of Communication Arts Technologies at Montgomery College. A professor of art for three decades, he has been an outstanding and interesting teacher in many subjects in fine art and applied design at some very cool colleges in the United States and abroad. 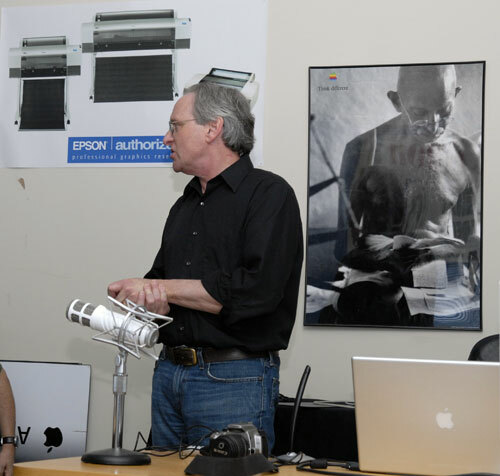 Currently Harry teaches classes on digital tools for graphic design, including iLife for communication, for which he designed useful podcasts for his students. His bookshelf of recommended reading is unsurpassed. Harry St. Ours addresses the April Graphic Arts SIG. Note the very nice podcasting microphone on the table. Photo by Richard Sanderson, taken with a Nikon D-200 digital camera. At this meeting St. Ours presented many aspects of social networking and micro-blogging Web sites including: Twitter, Facebook and Second Life. Next he discussed useful aspects of Apple’s iLife ’08, emphasizing that the real power of iLife is in the integration of the applications, especially iPhoto, iMovie, and iDVD. He elaborated on the fun and educational aspects of podcasting and brought up many advantages of a .mac account including Web Gallery as a great way to share high-quality photos and movies with friends and family. 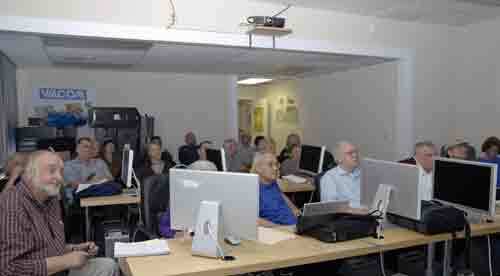 A full house was on hand for April’s Graphic Arts SIG presentation by Harry St. Ours. Photo by Richard Sanderson, taken with a Nikon D-200 digital camera.